South Korea didn’t need any ninth-inning heroics in the Premier 12 final. They had this one well in hand pretty early on. Kim Hyun-soo drove in three runs, slugger Park Byung-ho, likely MLB-bound, connected on a towering three-run homer, and the South Koreans battered the U.S. pitching staff on their way to being crowned inaugural champions of the Premier 12 with a 8-0 victory in the final on Saturday at Tokyo Dome. South Korea finished the tournament with an 6-2 record and avenged losses against Japan, rallying from three runs down in the ninth inning, and the U.S. in the semifinal and final. Kim Hyun-soo was named Premier 12 MVP. Japan’s Shohei Otani won the tournament’s ERA title and Hayato Sakamoto was named outstanding defensive player. The U.S. was dealt a blow from Major League Baseball before even taking the field against the Koreans on Saturday. The deadline for adding players to the 40-man roster in MLB was 8 p.m. on Friday in the U.S. (10 a.m. Saturday morning in Japan) and Team USA members Brett Eibner, an outfielder, and pitchers J.B. Wendelken and Jake Barrett were called up by the Kansas City Royals, Chicago White Sox and Arizona Diamondbacks respectively. Because MLB isn’t allowing players on 40-man rosters to participate in the Premier 12, the promotions meant the trio was taken off the roster before the final. Eibner was a notable subtraction. The 26-year-old had started every game for the U.S. and hit .259 with a double, a triple, and a team-high seven RBIs. One of those RBIs came in the 10th inning of the Team USA’s 3-2 win over the South Koreans in their first meeting on Nov. 15. 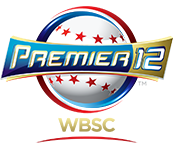 TOKYO -- Following 38 global games, the WBSC announced the first-ever Premier12 All-World Team.